We’d like to highlight the most obvious new addition at The Inn—Bright-Eyed Brew Co.! Katherine and Ryan Reaux are the dynamic husband and wife duo behind this delicious and hip coffee shop. Bright-Eyed got started as a farmer’s market pop-up and can now be found at multiple local businesses along the Gulf Coast including Gulfport-Biloxi International Airport! The Inn is honored and excited that the Reauxs chose The Inn for their first brick & mortar location! Bright-Eyed offers specialty nitro-brew coffee in many delicious flavors—our favorite is the Bananas Foster—and Belgian waffles with toppings such as Nutella and powdered sugar. Flying into Gulfport to stay with us? Pick up some Bright-Eyed after grabbing your luggage, hail your Uber/Lyft, and head over to Ocean Springs for waffles and more nitro! Yum! Picture courtesy of Dashing Darling, a fashion and lifestyle blogger who recently enjoyed a weekend away with us. Our 10 Year Anniversary Renovations! The Inn is celebrating being open in beautiful downtown Ocean Springs for 10 YEARS this November! What better way to celebrate a decade of growth than a fun renovation of our suites? We are currently renovating the Avenue and Mackey suites with the addition of modern light fixtures and furnishings, artwork, and NEW bathrooms! Walking into the Avenue suite, you’ll find our antique gold and hand-painted chandelier highlighted against our new black ceilings at 12 feet high, a modern headboard, and artwork…as well as custom blackout curtains! 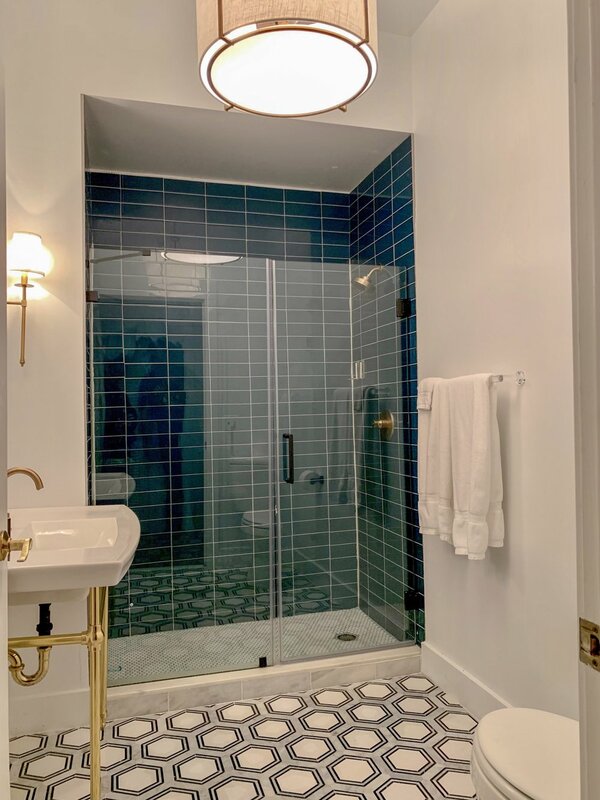 The modern, spa-inspired bathroom features glass and marble custom tile as the flooring and inside the walk-in glass shower, designer lighting, and an opulent brass vanity. The Mackey suite has changed from a Queen bed to a King bed flanked by 6 ft. antique mirrors. Also included in the renovation is custom designer lighting, modern furnishings, botanical artwork, and a completely renovated bathroom to come!